UPDATED: Thu., June 28, 2018, 5:49 p.m. 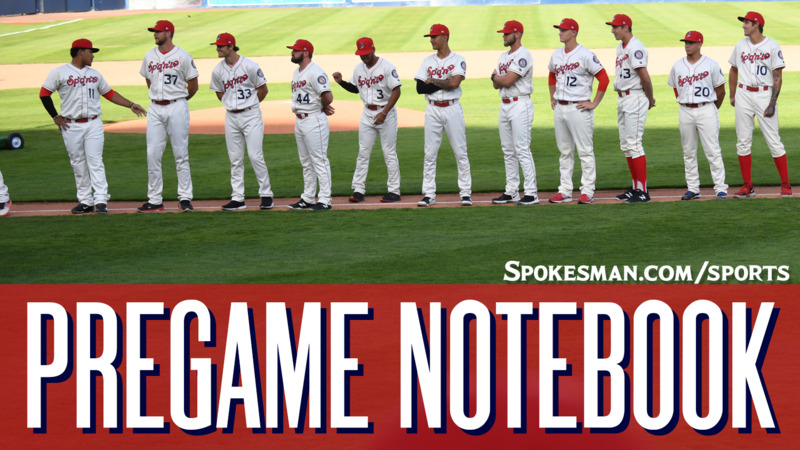 The Spokane Indians (6-7) take on the Everett AquaSox (7-6) in the finale of a three-game Northwest League series at Avista Stadium at 6:30 p.m. The Indians send LHP Jake Latz (0-0, 2.79) against RHP Jheyson Carabello (2-0, 2.45). Latz is making his third start for Spokane, which has won its last four. He’s allowed three earned runs on seven hits and three walks over 9.2 innings with 13 strikeouts. Caraballo is making his third start for the AquaSox. He’s allowed three earned runs on seven hits and two walks over 11 innings with six strikeouts. He’s given up two home runs. Lineup: CF J.P. Martinez, 2B Troy Dixon, RF Starling Joseph, DH Tanner Gardner, 1B Curtis Terry, SS Cristian Inoa, LF Hasuan Viera, C Isaias Quiroz, 3B Tyler Depreta-Johnson. Last night: Hans Crouse struck out six over five shutout innings, allowed two hits and two walks and the Indians (6-7) beat the visiting AquaSox (7-6) for their fourth straight victory. Transaction: After Wednesday’s game, the team confirmed that Texas Rangers No. 17 prospect outfielder Miguel Aparicio was promoted to Low-A Hickory and outfielder Austin O’Banion was sent to Spokane. Promotion: Family Feast Night. All hot dogs, ice cream sandwiches and Pepsi products are only $1.00 all night long! Stick around after the game to participate in the Taco Ball Toss benefiting the Boys & Girls Club of Spokane and Kootenai County. Weather: Game time – Cloudy, 73. Final out – Partly cloudy, 63. Published: June 28, 2018, 5:09 p.m. Updated: June 28, 2018, 5:49 p.m.